Pool has so many variations that it can be overwhelming to learn a new game. However, many games are based off the rules of classic games. By knowing classic game rules and brushing up your skills, you will be ready to take on an exciting new game. 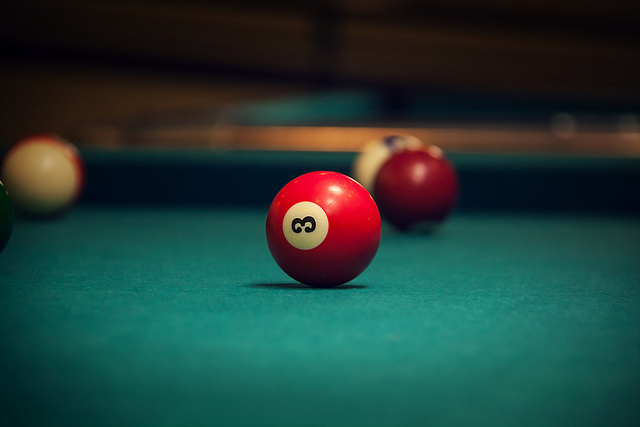 Eight-ball is the most commonly played pool game in the US. Inside the triangular rack, the eight is placed in the middle and a striped ball is placed in one back corner and a solid ball placed in the other. The rest of the balls can be placed in random order. The cue-ball is used to break the rack apart. If the eight-ball is pocketed at the break, the breaker can choose to either re-rack or re-spot the ball. Each player takes shots until they commit a foul or illegally pocket a ball. When a player or team legally pockets a ball, they may choose their object ball—stripes or solids. This assignment stays fixed through the rest of the game. Once all of a player/team’s balls have been pocketed, they can attempt to pocket the eight-ball into a designated pocket. If the eight-ball is knocked off the table, or the eight-ball is pocketed into a different pocket than the one designated, that player loses the game. If the opposing player knocks the eight ball off the table or legally pockets the eight-ball (without clearing their object balls,) they win the game. Most American bar rules require all shots to be called in detail. Fouls in eight-ball are common to most pool games. If the cue ball is pocketed, or does not strike any object balls, that is a foul. Illegal jump shots are considered a foul in eight-ball. Pushing the cue ball rather than striking the cue ball is also a foul. Shooting before all balls from the previous balls have come to a stop is a foul. Touching any ball with anything other than the tip of the cue is considered a foul. Generally, a foul will cause a loss of turn. The shooter earns a foul if they knock a ball off the table, or by shooting out of turn. The shooter must only strike the cue ball once per shot. The shooter must have at least one foot on the floor (this rule is adjusted accordingly.) Eight-ball rules may vary, but follow the same general guideline. Nine-ball gained popularity in the United States in the 1920’s and has remained a popular recreational and professional game. The object of the game is to pocket the nine-ball, while pocketing the object balls in numerical order. The balls numbered 1-9 are racked with the 9 in the center and the 1 at the foot spot. 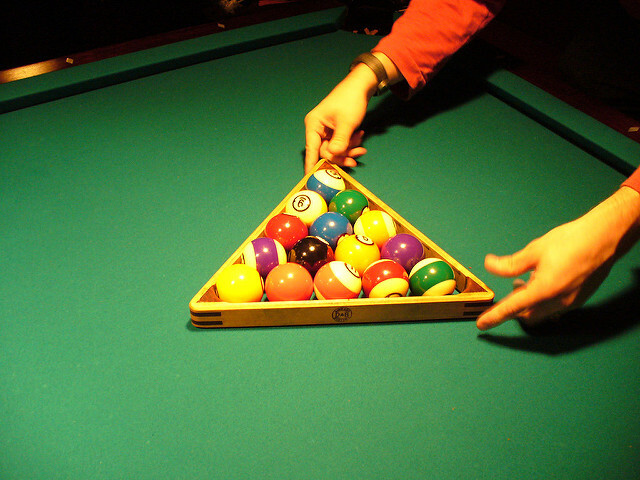 Triangular racks or special diamond shaped racks can be used for nine-ball. The first player, chosen ahead of time, breaks the rack with the cue ball. The game is played in innings, which means they can each shoot until a foul is committed. Each player must attempt to pocket their object balls in descending numerical order. Winning can occur at any point of the game a player hits the lowest number ball first and the nine-ball without committing any fouls. Nine-ball is a fast-paced game, making it perfect for tournament or match play. Variations of nine-ball include seven-ball and fifteen-ball and are played by similar rules. This quick folk game is popular with certain subcultures and is frequently gambled on. Three-ball is also used to practice shooting skills. The goal is to pocket the three object balls in as few shots as possible. The quick nature of three-ball allows for large numbers of players to join a tournament. Three-ball is generally played with 3-5 innings per player. Matches consist of multi-inning rounds either back-to-back or spread out over time. The object balls are usually racked by hand, in no particular order. The side of a triangle rack can also be used. 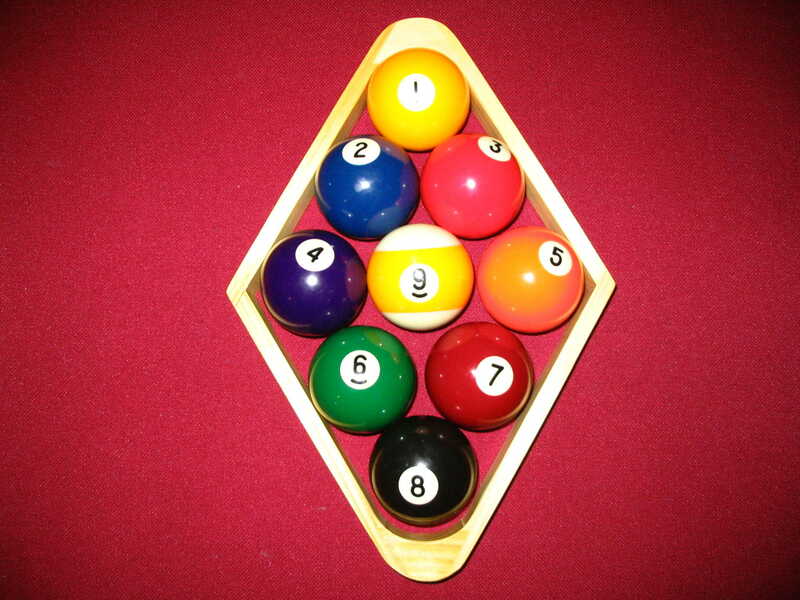 To prevent cheating, players are not usually permitted to rack their own balls. The break is considered part of the score and any balls pocketed during the break are considered legal. Points are added to the player’s score for each score and foul. The player plays until all object balls are pocketed. The maximum number of points must be determined beforehand and once it has been reached, the next player takes their turn. The player with the lowest score, including fouls, is the winner. In the event of a tie, all players remain in the game until they are willing to yield. Three-ball is a casual game, with no official rules, so the rules and fouls will vary from region to region. These are just three game variations. Each region has their own games and rules. Whether you play at a bar or at home, learning a new game will always add to your experience. Find all the things you need to furnish the ultimate game room at GameTablesOnline.com, including classic pool tables and all the finishing touches.